This is in continuation of the series of blogs where we will be covering some of common development tools used for Bluetooth smart applications. In this part, I will be describing the popular Bluetooth LE SDK from Cypress Semiconductors. BLE Peripheral: A BLE enabled device which will act as a server. This device has the broadcasting/advertising capability. It can both send and receive data to other BLE central device, however it cannot make connection to BLE central device, it can only respond to BLE connection request from other central devices. BLE Central: A BLE enabled device which can connect to a peripheral device. It can scan the nearby peripheral devices and can make a BLE connection if it wants to send/receive data from peripheral device. Service: Services are collections of characteristics and relationships to other services that encapsulate the behaviour of part of a device. A service is quite simply the thing that a device can do. For example a device which implements the standard LinkLoss service will have a way of knowing when a connected device either goes out of range or simply terminate the connection. In this case we will be implementing the Link Loss service in the BLE module to identify when the device gets disconnected and take some action. We will also implement a custom service to exchange data over the BLE connection. Characteristic: Characteristics are defined attribute types that contain a single logical value. A characteristic is all of the information that can be shared across the services. In our case we will use the AlertLevel characteristic to decide what action to take on BLE link loss. Also we will add a custom characteristic through which data can be transmitted over when in connected mode. 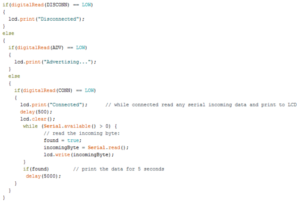 The use case that we have developed deals with displaying the state of a BLE peripheral device as and when some central device connects, disconnects and sends data over the BLE channel. There will a BLE peripheral device which will be in advertising mode. This device will be connected to an LCD display device which will display the current state of the device. If the device is not connected to any other BLE device, then LCD will display “Advertising…” Once a central device X connects to the device, the LCD should display “Device X connected”. When X is connected to the peripheral it can send some data over the BLE channel which should also be displayed on the LCD. Once X goes out of range the display should read “Device X disconnected” for around 20 seconds after which it should again display “Advertising…” and wait for connection to other central devices. CY8CKIT-142 PSoC 4 BLE module: This is the device which will act as our BLE peripheral device. The firmware of this device can be updated using PSoC creator IDE (short for Programmable System on Chip) and BLE Pioneer baseboard on top which the BLE module can be directly mounted on. Arduino LCD Keypad Shield: This is the display device which will be used to display current status of the BLE module. The BLE module has a firmware running a custom profile consisting of two services viz. Link Loss service which will enable it to take some action when the client (or central) goes out of range and a Custom Service which will let the client to send/receive some data. The BLE module is powered through the Arduino board (3.3 V and GND). Three of the output pins of the BLE module(3.6, 3.7 and 2.6) are used to map the three states of the module i.e. Advertising, Connected and Disconnected (PS: We can use just 2 pins to map three states, but for the sake of simplicity we have used three pins for the development). These pins are given to Arduino as input by which the firmware running on it will display the states on the LCD shield. 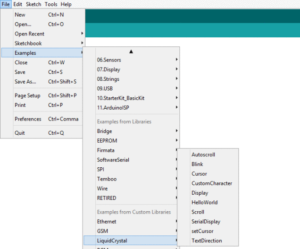 When in connected state the client can send some data on the custom service of the module which can then be transmitted to Arduino through UART channel. 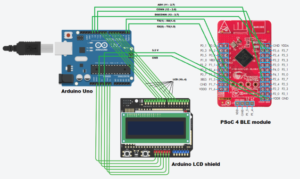 For this the Tx and Rx pin of BLE module (1.5 and 1.4) are connected to Rx and Tx pin of Arduino (0 and 1). The firmware running on Arduino will also display this data on the LCD shield. 2. 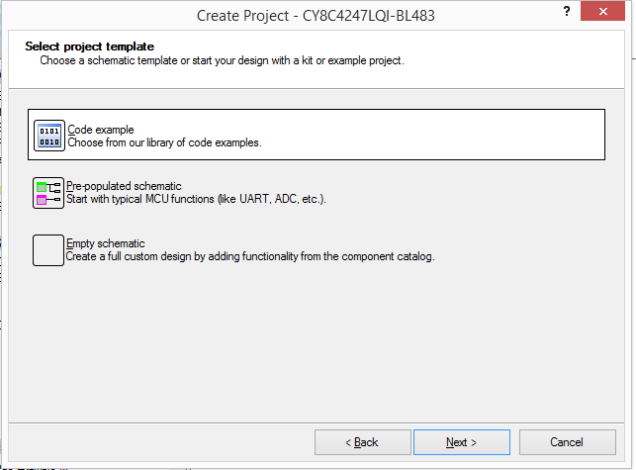 In the select project template dialog, select Code example since we will be modifying the existing Proximity profile. 3. In the next dialog box, type “BLE_Proximity” in the filter and select the matching option. 4.Give suitable name to the project and workspace and click Finish. Link Loss service: This service will be already present in the Proximity Profile tab. It will have a characteristic called AlertLevel which can be updated by the client to be one of the three values namely ‘No Alert’, ’Mid Alert’ and ’High Alert’. The application logic to be performed based on the value of this characteristics will be explained shortly. Custom Service: Add this as a new service under Proximity profile. By default a custom characteristic will be present under the service. Since the client will be sending data for this characteristics as a text, we need to change the data type of this characteristic from default unit8 to uint8 array. By default this property will have Read and Write enabled. This tells the client what it can do with the characteristic. 2. Generate code: Once we click on Generate Application (under Build menu option), all the required code for different components of our system will be automatically generated. loop() – This is the main loop of the application where the application waits for an event to occur and process the events accordingly. 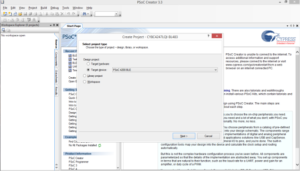 Generate and upload hex file: Building the project in solution explorer will generate the hex file which can be uploaded to the BLE module using the ‘Program’ option in the Debug menu. The module should be connected via USB cable to the laptop/computer running PSoC creator. Once the code start to push, the green LED will start blinking indicating that code is being pushed. 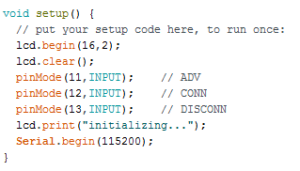 Writing code for Arduino is similar in nature to that of PSoC Creator. 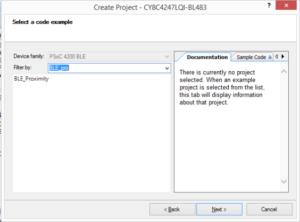 Once you create a new project, two methods are supplied by default which we need to implement namely setup() and loop(). The setup method needs to have the initialization of different components while the loop method need to have the application logic. The global variables can be defined at the top of the code.